Three months in and there has only still been the initial two purchases of Mr. Tiddles from the first month of release in January. Although this is somewhat disappointing, but on the bright side, the ad revenue has seen a 3.6 fold increase! Unfortunately 3.6 times 49 cents isn't a alot, but it is improvement! During March, I did not tweak any of the AdMob settings though did constantly tweet and promote the game via Twitter, Googe Plus and Facebook. Promotion via social media helped a little - installs increased steadily, but only at approximately one a day. April will be an interesting month, as I plan on cutting down the social media promotion to see how it will affect the install rate. I do have some plans to make updates to the game and possibly release it on the Samsung Store to increase downloads, however time is tight and procrastination is hard to avoid! Unless you've been living under a rock, chances are you've heard of 2048, a simple game where you slide to merge tiles of the same number and aim to get the elusive 2048 tile. With this idea in mind, my weekend plans went out the window and most of it was spent prototyping the idea which would eventually be called connect three. The easy path would've been to fork 2048 and make tweaks here and there, but that wouldn't be half as fun. So instead, decided to start from scratch! Better name? Naming is hard! Head over to http://dx3.psychopyko.com/connect-three/ to give it a go! Edit: Not long after this blog, I was pointed to this blog post by Asher, one of the creators of Threes. The blog post is essentially about all the thought and hardwork they took to come up with the final product and the various clones/rip-offs of Threes (which includes 2048). Making Connect Three was probably more a learning process than anything (like most of my games actually), though I purposefully avoided numbers and merging to try and be different. 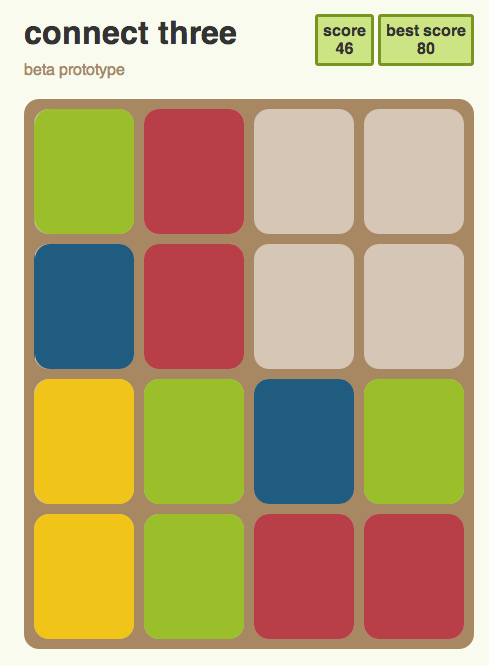 Lastly, I have said it is a 2048 inspired game simply because I haven't actually played Threes. Purchased and installed on my phone, but the game fails to load... time for a new phone! Towards the last few months of development of Mr. Tiddles, I borrowed a few phones from friends to test and make sure Mr. Tiddles would run as expected on different phones. One problem which was not anticipated, but surfaced very quickly was that without root access, you do not have access to the /data directory on the phone - thus no access to view the xml file where shared preferences are stored. After the run-as command, you will then be able to access the contents under the directory: /data/data/<package-name>. One thing to note is that your apk will need to be a debug build (ie. signed by the debug key or have debug flag enabled). This really isn't too much of an issue, especially when you're debugging. In fact, I find it's nice to know that the data of properly signed/built apks are not that easily visible. This is the second installment of my "Income Report" which details the revenue coming from Mr. Tiddles. As you can see, for the month of February, there were no in-app purchases, though the ads did generate a bit more revenue. If you're on the ball, you'll notice that the number of impressions this month has actually dropped to 585 compared to the 868 impressions in January. A reasonable guess would be that there were less people playing, however, this is not the case. In fact, due to my attempt to spread the word of Mr. Tiddles as much as possible halfway through February, the number of users actually increased. So, why did the number of impressions decrease? Well, during most of January (and first half of February) I actually had the Refresh Rate set at 30 seconds. After doing some research into AdMob and mobile ads, it was clear that in general, a longer refresh rate is better. Therefore, I increased it to 90 seconds. A quick summary for the reasoning behind a longer Refresh Rate is that it increases the chance a player will see and click an ad. Additionally, it will likely increase your Impressions CTR percentage as the denominator (ie. impressions) is smaller. Roughly 6 weeks ago, my first Android game Mr. Tiddles was released into the wild. So now I think it is time to have a look at some stats! To keep things simple, the below numbers are before tax and before Google takes their 30% cut. Unfortunately, unlike Flappy Bird, instead of the rumoured $50k a day *dreams*, it is a humble $2.19 for the month - with Google and the tax-man stil to take their share. Honestly, I was actually expecting more, but I guess it is a start. Sadly, the number of new/active users seem to have plateaued so realistically the expected report for February will probably look even sadder. One of the ways to increase the app's potential income would be to increase the number of users. To increase the number of users, I will need to make an update of the app and/or do some form of marketing and hope that more users will leave reviews for the app. If you have any ideas, let me know at @dx3droid - I'm all ears! Two weeks ago, I released my first Android game: Mr. Tiddles. As with any sizeable project, there was much to be learnt, both technical and non-technical. In this post, I'll talk about the three main non-technical points I picked up along the way. Despite wanting to make a game for a long time, it was only about a year ago that I actually sat down and really started. Before that, I had a long list of reasons as to why I couldn't do it: not enough time, sub-par skills, and so on. You get the idea. However, I soon realised that I'll never be ready enough, and that time can be taken back one website and one TV show at a time. So one day, I decided enough was enough. I sat down and started with the simple goal of getting an image displayed on the screen. What I discovered that day is: just do it. Start with your idea, get something on the screen, move it, tweak it and slowly iterate so it becomes closer what you have in mind. You will learn a lot this way. A lot more than reading, researching and trying to learn everything. Better yet, you'll have something to play with, so you can give your ideas a reality check. Once you have something that works, even partially, ask a friend for their opinion. The graphics don't have to be perfect (or even decent), nor does the game have to work from end to end; as long as the core idea is there, that's enough. What you want is people's feedback. More than likely, you'll be surprised at how differently someone interprets what you think is super obvious or easy. Be warned, the feedback you receive will likely frustrate you and might even go directly against what you have in mind. If this is the case, you need to ask yourself "Why?". Don't jump in with a hasty fix, but determine what the root of the problem is. Keep making improvements, keep testing and if you still receive the same feedback, it might mean the mechanic doesn't work or you still haven't got it quite down pat yet. Even after you've got something that more or less resembles what you have in mind, you should still continue to test it. By now you probably know the game inside-out, so you need someone to provide you with a fresh perspective. Is it too hard? Too easy? Is the menu and flow of the game intuitive? Do people understand what's going on? Depending on the feedback, be prepared to change your initial concept of the game. Sometimes, what you think is a great idea might not be as great as you think. It might just need a small tweak, or it might need a completely different approach. Secondly, set yourself a reasonable deadline and stick to it. This means, be prepared to leave features out. More than likely, you'll have lots of ideas and features that you would like to be in the game. But as the deadline draws near, be honest with yourself: Does the game really need that feature to work? If not, consider leaving it out. Personally, I think one of the most important things for your first game is to actually finish and release it. In order to achieve this, don't be afraid to leave parts out of the first release. You can always release updates with more features! After many months of hacking away at the computer, learning to use Gimp and Inkscape, cursing at Google's horrible in-app billing testing environment, and general game dev stuff... my first game, Mr. Tiddles is now available on the Google Play Store! It's a simple game in all aspects, but I'm still happy with the result. The main goal for this game has been achieved - create a game, finish it, and make it available on the Play Store for all to enjoy! Throughout the process, I have learnt many many things - some which I have started to blog about, others which are still blog posts yet to be written. Few months ago, I started working on the menus for Mr. Tiddles and very quickly found the amazing ImageTextButton that comes with libgdx. It is basically exactly what I needed: a button composed of an image and a label. The default configuration is image on the left and text on the right which worked perfectly for the main menu. However, due to space/position, for the end game screen, I needed a button with the image on top and text below. After quite some struggle, lots of hacking, and even a pull-request to the libgdx repository, Nathan Sweet showed me how it can easily be done. Since I don't recall finding the solution documented, here it is below. Hopefully it will save you several hours when you are in need of a vertial image text button, or an image text button with some funky layout configuration. As you can probably guess, the 'magic' is in clearChildren() as you are now able to re-add the elements of the button in whatever configuration you need. When you want to create a new row for the next elements, simply use row() and they will appear under the previous items. For my first game, Mr Tiddles, I decided to add achievements via Google Game Services. One of these achievements is "Finish game with a prime score". This will definitely work, but if n is a large prime, it would have to iterate through a lot of numbers before coming to a conclusion. Good news is, there is a better and more efficeint way! A quick Google search reveals a Wikipedia page on Primality tests. There are many methods/approches listed there, I gravitated towards one particular description under Naive methods. For the curious, the two posts from 2011 were migrated from the old blog to here as I felt they still had value and would be useful. Hopefully, there will be many more useful/interesting blog posts to come! A bit more than one week ago, I published my first app on the Android Market :) All in all it all went well, but as with all things it wasn’t without drama! In this post, I’ll talk a bit about the parts of the AndroidManifest.xml file that I found relavant to publishing an app. Let’s look at the manifest tag first, there are four elements of interest, starting with what I consider the ‘trickiest’. The important thing to note here is once you’ve uploaded an apk with package name you’re stuck with it. If you made a mistake, you can’t re-upload it to fix the package name. You will need to first unpublish the incorrect app (so people won’t be able to see it) and then create a "new" app with the correct package name (yep I stuffed up the first time, that’s how I know). I haven’t tried, but I would guess that if later in the future you decide you do want to use package name, you’ll have to upload another apk over your initial "mistake" and publish it for the world to see. This element is the way to determine if one version of your apk is newer or older than another. It has to be an integer, where the higher the number the newer the version. This number isn’t shown to users at all. Remember to bump this number every time you make an update! Ok, that’s pretty much about it for the manifest tag, now let’s have a look at the next three tags uses-permission, uses-sdk and application. This here lets Android know what permissions your app needs in order to work. In my case, the TPG Monitor is a fairly simple app, so all I needed is the Internet, so that is all I have defined. In my opinion, it is best to have as few permissions as possible – that way your users won’t need to wonder why your app is asking for permissions x, y, z. There are of course, many other permissions, and you might legitimately need them if your app does fancy cool stuff. This tag will allow you to define your "minSdkVersion", "maxSdkVersion" and "targetSdkVersion". The value you specify is an integer that corresponds to the API Level (eg. Froyo = Android 2.2 = 8). Firstly, I would suggest not to define "maxSdkVersion" – there is no reason why you would want to restrict your app from future releases of Android OS. The reason I defined "minSdkVersion=4" (Donut) is because of permissions. My app runs fine on Cupcake (Android 1.5, API Level 3), however, due to a bug in Android 1.5, even specifically only specifying the permission "INTERNET", Cupcake will request for two additional permissions: "WRITE_EXTERNAL_STORAGE" and "READ_PHONE_STATE". So given the small % of users on Cupcake and my dislike of my app asking for two additional permissions, I made the decision to not support Cupcake and have my app only ask for the one permission it needs. These two will simply define the name and icon that is displayed to the user. The name should really be in your strings.xml, so it can be internationalised (but I felt lazy) – it is what you want to call your app. For example, it is the label that appears under the icon on your phone. The icon should be a png (three separate png files actually) that lives in the "drawable-ldpi, drawable-mdpi, drawable-hdpi" directories under the "res" directory. The filename is the same as what is defined in the xml file (so my icons are all called: iclaunchertpg.png). If you’re wondering what’s the deal with ldpi/mdpi/hdpi it is to cater for the various screen types of Android phones – Android docs provides a fairly comprehensive icon design guideline. So, you’ve been working endless nights trying to get your app up and running and you’re nearly there. Most things are working; but it’s just not quite ready to be released into the Play Store; but you want people to see what you’ve done so far, or give people a teaser for what to expect. That’s the situation I’m in right now! 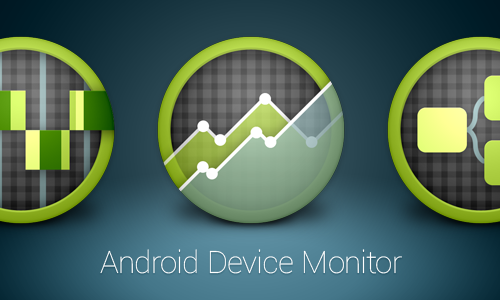 Android Device Monitor is a stand-alone tool that provides a graphical user interface for several Android application debugging and analysis tools. Note: I've updated this post. The old method (which still works) is to use the Dalvik Debug Monitor Service (DDMS). If you don't have 'monitor' available in your version of the Android SDK, you can achieve the same results, but in Step #2, type 'ddms' and under the 'Device' menu you should find the 'Screen Capture' option.